With Valentine's Day around the corner, you may be freaking about what to say to your secret crush or what to buy your BF. Take a break from the stress with these DIY gifts to give to the girls who will always be by your side...your BFFs! Let your girls know how sweet you think they are with this yummy gift. 1. Hot glue/Super glue the four candy boxes together vertically to create a "vase" for the bouquet. 2. Place gift bag in the "vase" and glue it to the sides of the boxes. 3. Glue candy to the wooden skewers, making sure that they're tall enough to stick out of the top of the vase. 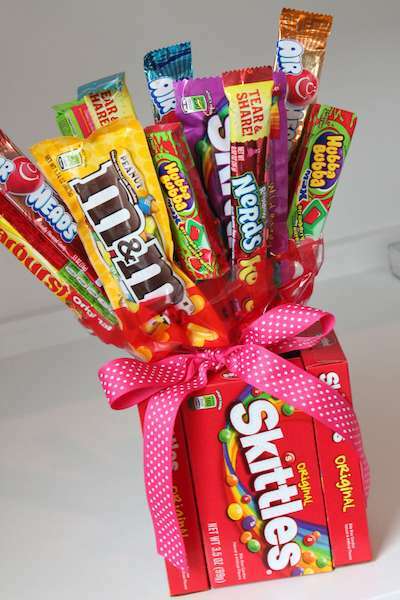 Also be sure some candies are at different heights so that they all fit inside the vase. 4. Tie ribbon around the vase in a bow. To ensure the ribbon doesn't slip, you can glue it to the vase. Do away with cards this year and express your love with a canvas instead. 1. Paint the top half of your canvas completely white (even if it's already white) and paint the bottom half completely pink. 2. Blend the two halves together so that the canvas is ombré, going from white at the top to dark pink at the bottom. (This is where having a pigmented color comes in handy.) In the middle, there should be a light pink and medium pink. Imagine there are four rectangles going across the canvas, each one becoming a darker shade of pink. 3. In the appropriate color, use a straightedge to paint lines that actually cut the canvas into four rectangles. The lines should be horizontal across the canvas. 4. Wait for the canvas to dry. 5. In the second rectangle from the top, paint the word "love" in white paint. This is where you may use a stencil if you want. Otherwise, you can just freehand the letters. If you're freehanding the letters, you may want to sketch them with your pencil first. 6. 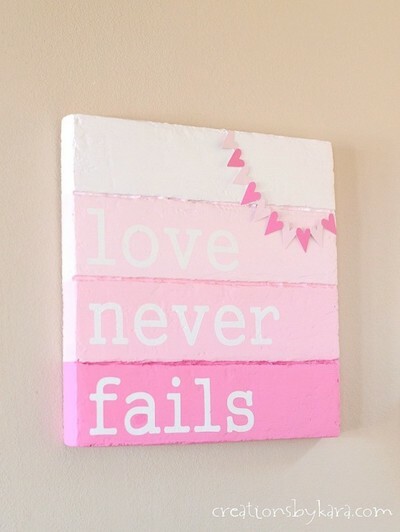 In the next rectangle down, paint "never" and in the rectangle after that paint "fails." 7. Let the canvas dry. 8. In the top right corner, draw (and then paint) a half circle of small pink hearts, hanging from the corner and falling into the painting. 9. Wait for the canvases to dry before giving it to friends! 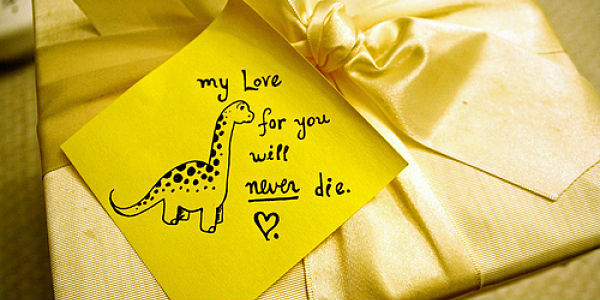 Let your BFFs know how much you love them today and every day with these daily post-it notes. Gel pens, sharpies, markers, etc. 1. Write the date (starting with Feb. 14) on the top of the Post-it. 3. Do this for every note until you get to the end of the pack. 4. Tip: Use different colored Post-it notes and write your messages in fun colors! 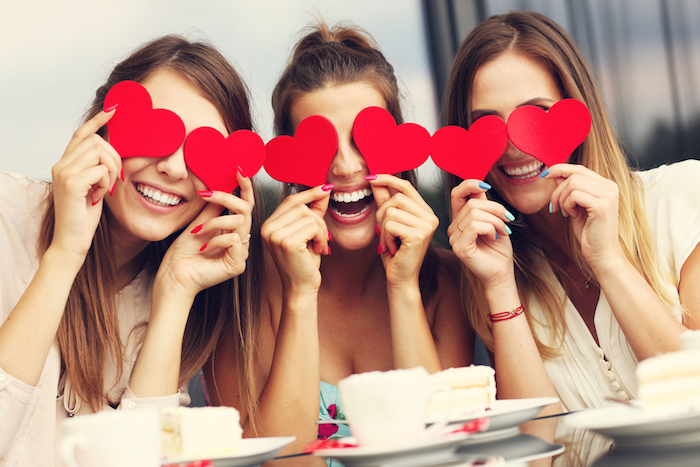 What are you gifting your besties this V-Day? Share in the comments!